After a crazy visa run in Penang, Malaysia. I heard recently that Thai Immigration has ceased the issuance of Double Entry Tourist Visa in all immigration and consulate offices around Thai borders. 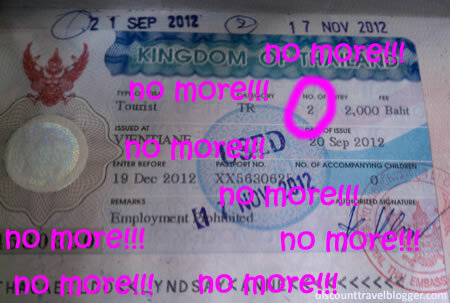 It was late last year when I had my first visa run to Laos. I was then planning to do it in Cambodia since it is closer to Bangkok. However, I was advised that Thai Immigration in Cambodia does not issue a double-entry visa anymore and I was advise to cross the Laos border instead for the said visa. The hearsay was that it is only at the Thai Immigration in Laos that issue the double-entry visa which takes 120 days. That would allow the visa holder to stay 60 days and would have to leave Thailand by then and re-enter again for another 60 days. Recently, I heard people talking about Thai Immigration in Laos stopped issuing the double-entry visa too, which makes every border around Thailand has ceased issuing the said tourist visa. Why Hostelling is Popular to Backpackers?